​Who loves pizza? I do! It is up there on my most cherished comfort foods. Make it vegan, gluten, yeast and oil-free and now you can can not feel bloated or like you had junk food. I call this a Powerfully Healthy Pizza Crust as it is filled with plant-powered goodness. You will not find cholesterol, dairy, oil or gluten in this crust. What will you find? 6 grams of protein in each slice, healthy carbs, high amounts of magnesium and phosphorus, "a critical component of every cell." When you top the crust with spinach pesto (or regular pesto) and vegetables it makes a vibrantly bright and inviting pizza pie! So sit back, eat a slice (or two) of pizza and let the plant based goodness do the work for you, bringing you to greater health! Preheat to 450 degrees. Place corn flour (harina de maiz) on the baking pan, this will give it a yummy taste. Make flour by blending almonds, quinoa and seeds into fine flour. Transfer to med-lg bowl. Mix in dry. Mix in wet. With wet hands create a ball. Place the ball of dough on a floured surface, sprinkle the ball with corn flour or desired flour, use a floured rolling pin to gently roll out. Carefully transfer to the pan. Bake for 15 min to 20 min until golden brown and middle puffs back when you press on it. Top as desired and bake 5-10 min. Serve as is or with a side salad. I went to the market Saturday to pick up some fresh fruit and veggies and some of our favorite dry goods (cashews, almonds, dates, coconut milk and so on.) The fruit store I went into was restocking their shelves and I noticed fresh spinach in a huge bag. I asked if I could have some since the spinach that was out was wilted. They said I could but offered it as a HUGE bundle, I mean it was like a bouquet of flowers but spinach. I excitedly took it and knew we'd find a way to eat it. After making fresh batches of V10 and a big salad I still had quite a bit left. I decided it would make a nice pesto, I looked up some inspiration and decided oil-free was a must. I used my recipe as a base and replaced the basil with spinach and added all of the dried basil I could find in my cupboard, 1/2 cup, turned out nice! ​Spinach, lemon, garlic, dried basil create a delicious flavor base added with water and pecans for extra creaminess, with cashews and a tiny bit of mustard for that "somewhat cheesy" flavor. How is it? Creamy, smooth, tasty, you can place it in the fridge or freeze it in cubes for later. We had it on pizza tonight and it was ammmmazzing, I'll share that next! Combine ingredients in a blender, blend until completely smooth. Use it on your favorite dish, store in a sealed container (lemon juice on top helps prevent darkening.) You can also freeze in an ice cube tray, silicone cups or as desired. Preheat the oven to 500 degrees F or set to broil. Wash the bell peppers, slice in half, remove the stem, seeds and ribs. Place the sliced side down on a lightly greased pan or line with parchment paper. Place the onion on the pan, sliced side down. Take the head of garlic, chop a little of the top off and squeeze lemon juice inside, cover with foil and place the the pan. Bake for 30 minutes or until the peppers have bubbling skin. If serving over pasta, prepare the pasta as according the package instructions while the peppers are roasting. Remove the peppers from the oven, cover with a clean kitchen towel for 3-5 minutes, remove the skin once cool enough to handle. Place peppers in a blender, pop the roasted garlic out of the peel and place in the blender, add the roasted onion, dairy free milk, corn starch, salt and pepper. Blend until completely smooth, serve over pasta. If needed, reheat and serve hot with pasta or as desired. Tip: Serve with a salad and bread for a delightful meal with vegan Parmesan cheese on top! I thought I'd give it the ultimate test and make a new recipe from it. After browsing mouthwatering recipes...I decided the featured Blueberry Cheesecake was a must do! The crust blew me away, it is made with sunflower seeds, who knew? It was cookie dough like, stuck together brilliantly and tasted wonderful. It was topped with healthy blueberry cashew cheesecake. All using few ingredients that are really good for you! How were they? Amazingly soft, some of the creamiest cashew cheesecake I ever did taste. My husband and I both really loved it. Thank you OGP and Lucie Javorska for the great recipe! I made cupcake size because my freezer is full of sorbet. Here is how they turned out! ﻿I was able to download the app, browse thousands of recipes that are truly extraordinary, make and eat amazing cheesecake within 24 hours or less! You can join me or make whatever your heart pleases as One Green Planet is offering Artistic Vegan followers exclusive early access before their release date of 4/22 on Earth Day! Click this link: https://itunes.apple.com/us/app/food-monster-5000+-recipes./id1052988561?mt=8. One Green Planet and their new Food Monster iPhone app offer a plethora of vegan recipes showing you how anyone can go vegan. Look at this plant-based burger! DOWNLOAD THE FOOD MONSTER APP - CLICK HERE! 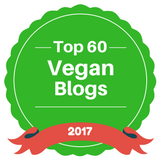 You do need a premium subscription to have full access but I think it is well worth it giving you access to 5000+ vegan recipes with 10+ added daily, wow. Why download it? It is like a vegan library of the best of the best recipes. If you don't have the funds, you can still browse their selection, including the free sections. It is exciting to see how many people already are vegan or are turning to this lifestyle. I hope to see millions more transition to a plant-based lifestyle. Here is a fun video featuring the new app, showing how it works and what to expect - access to delicious, mouthwatering, vegan food in an easy, organized way! Join me in congratulating One Green Planet on their success in bringing this app to life. I can only imagine the amount of time and effort that went into creating this new and exciting app! Place 1 cup of salad greens in each bowl. Divide the steamed sweet potatoes on top, divide the chickpeas on top, top with salsa and corn. I have been batch cooking so a lot of this was prepared ahead of time and I literally just had to take a handful of this and that to create a lovely meal for two! The salad is a basic salad with chopped spinach, celery, carrots, onion and bell pepper. Soak and boil or pressure cook the beans. If using canned garbanzo beans / chickpeas then drain and rinse. Save balance for other dishes. Prepare the corn ahead of time. Boil, bake, grill or pressure cook. I pressure cooked mine, cooled to touch and used a large serrated knife to cut off the cob. Some of the fondest memories of my grandma include her homemade zucchini bread. I had a couple extra zucchinis lying around and decided to make a loaf. I made a unique version that is free of gluten, dairy, oil and even sugar! I couldn't believe most zucchini bread recipes call for 1 cup of sugar, I always thought it was healthy since it had the word zucchini in it. Now, it really is healthy as cranberries or raisins are used instead of refined sugar to naturally sweeten the loaf. The results are better than I hoped for, it naturally puffs up while baking and then gets a nice golden crust. The inside was baked through and through. My husband and I found it extremely hard not to eat more than a serving, especially knowing how good it is for you. You are going to love this recipe! Preheat the oven to 350 degrees Fahrenheit. Lightly grease a bread pan and coat with flour. Combine the dairy free milk and apple cider vinegar in a medium size bowl, whisk together, set aside for 5 minutes. Stir in the aquafaba and whisk. Add the vanilla, mashed banana and shredded zucchini. In a separate medium to large bowl, mix together the dry ingredients. Make a well in the flour, add the wet and mix together. Pour into the loaf pan. Make a tent with foil and cover, bake for 40 minutes. Remove from oven, carefully remove the foil and bake for another 20 minutes uncovered or until a knife comes out clean. Cool, slice, serve. Stores well in a sealed container for 3 days, in the fridge for about a week and freezes well beyond that. Aquafaba is the commonly discarded bean juice that is made when boiling beans or found in a can of beans. Garbanzo is the most popular, however any bean juice will do, in fact I used the juice from making black beans. You can also use a different egg replacement if you prefer. If you do not have a gluten allergy you can use all purpose flour or a mixture of all purpose and wheat flour. I don't have an allergy yet prefer the way gluten-free bread makes me feel. A different sweetener like coconut sugar, agave, maple syrup and so forth may be used. Chocolate Chips, Coconut Flakes, Nuts can all be mixed in or added as toppings. Combine the ingredients together in a bowl, marinade for 20 minutes. Blend until smooth. Pour into a freezer safe bowl, cover with plastic wrap, freeze until halfway frozen. Remove, blend, transfer back to the bowl, re-cover. Freeze until halfway frozen, repeat and then place in the freezer overnight or until solid. Serve with Agave Lime Syrup! Combine ingredients in a measuring cup and mix together vigorously. Serve over the sorbet. Take a trip around the world with a combination of spices from different corners of the globe. Quinoa, fresh tomatoes, spinach, cilantro, a touch of parsley, onion, cucumber, jalapeno and lime juice are tossed together to create the base. It is then covered in a homemade Lemon Turmeric Oil-Free Dressing made with mint, fresh turmeric, ginger, lemon juice, agave, balsamic vinegar and a touch of salt and pepper. This salad is unbelievably healthy and well-balanced, it serves as a delicious meal or side. When placed in the fridge for a couple hours to overnight the natural colors from the turmeric brighten up the entire salad, it is equally as good fresh. This recipe makes four healthy servings and is wonderful for warm days. Combine the ingredients together in a large bowl. Mix well. Set aside to marinate for 15-20 minutes. Blend the ingredients together. Pour into a freezer safe dish, I find stainless steel yields quick results. Place plastic wrap on top and press directly onto the blended sorbet mixture. Place in freezer. Once it is half frozen, remove, blend and place back in freezer. Repeat 2 more times and then freeze until solid / overnight.